Come join in the fun and experience the World Pond Skimming Championships this Sunday 4/15. They are held in the base area of Vail Mountain's Golden Peak. With skis or a snowboard attached to their feet, pond skimming participants glide down a slippery slide that ends in a large pool of cool water. The length of the skim across the water's surface is measured, and winners get prizes for skimming the greatest distance before falling into the pool. 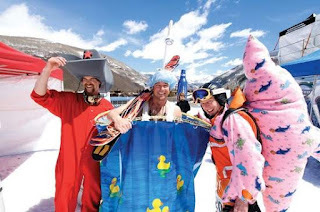 Participants often opt to wear fun costumes, which makes the atmosphere festive for all involved, skimmers and on-lookers alike. The World Pond Skimming Championships is open to anyone and everyone that believes they can make it across the pond. It is guaranteed to be a wet and wild good time! Participants must be 14 years of age and older. The top male and female finishers will receive a 2018/19 Epic Pass! All participants will get a special Helly Hansen backpack and other prizes will be awarded to the best crash, best costume and more!